The Hawks were viewed by prognosticators as perhaps the NBA’s worst team entering the 2018/19 season, and while they still didn’t crack the 30-win mark, they exceeded their modest expectations and flashed some intriguing long-term potential. With a handful of core pieces already in place, Atlanta has the draft assets and the cap flexibility to keep adding more this offseason. The Hawks have nine players on fully guaranteed contracts for 2019/20. If they simply keep those players plus both of their first-round picks, then renounce or waive the rest of their players, this would be their cap room projection. That’s not an unrealistic scenario, since none of Atlanta’s free agents are players the team must re-sign. The cap holds on the Hawks’ two first-round picks are wild cards here. For instance, if the club lucks out and jump from No. 5 to No. 1, the cap hold for that top pick would increase by more than $3.3MM. That’s a trade-off Atlanta would happily accept though, given the talent available at the very top of the draft. Conversely, if that second first-rounder, from the Mavericks, moves into the top four, it would be protected and Dallas would keep it, creating some extra cap space for the Hawks. Adams’ salary becomes fully guaranteed after July 19. The cap hold for these picks will depend on where they ultimately fall in the lottery. Additionally, if the second pick (currently projected to be No. 9 overall) moves into the top four, the Mavericks will keep it. The Hawks will lose this exception if they go under the cap to use room. This is a projected value. In the unlikely event that the Hawks remain over the cap, they’d instead gain access to the mid-level exception ($9,246,000) and bi-annual exception ($3,619,000). Dan Dial has been named president of the Hawks’ newly-relocated G League team, the College Park Skyhawks, according to a team press release. Dial spent the last seven years as president of baseball’s River City Rascals in the Frontier League. The G League team was previously called the BayHawks and located in Erie, Pa.
2:32pm: The Hawks have officially signed Davis to a multiyear deal, the team confirmed today in a press release. 1:28pm: Deyonta Davis‘ second 10-day contract with the Hawks expired overnight on Sunday, but the young big man won’t be leaving the team. According to Michael Scotto of The Athletic (via Twitter), Atlanta has reached an agreement with Davis on a multiyear deal. The 31st overall pick in the 2016 draft, Davis spent his first two NBA seasons with the Grizzlies before playing primarily for the Santa Cruz Warriors in the G League in 2018/19. A solid showing for Golden State’s NBAGL affiliate earned Davis a late-season call-up, and he has appeared in eight games since joining the Hawks, averaging 4.3 PPG and 4.4 RPG in 14.4 minutes per contest. While terms of Davis’ new deal aren’t known, it figures to be a minimum-salary contract that covers the final days of this season and all of 2019/20. Next year’s salary will almost certainly be non-guaranteed, perhaps with some offseason trigger dates. Once Davis officially re-signs, Atlanta will have a full 15-man roster. The Hawks’ deal with Davis appears likely be their final transaction of the regular season. ESPN’s Brian Windhorst chronicles the slow build to success for Hawks guard Trae Young, who continues to improve as the 2018/19 season nears the finish line. Young, a dominant shooter and passer in contention for the Rookie of the Year award, must continue to improve on defense in order to take his game to the next level. 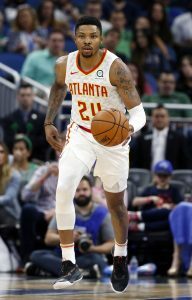 The Hawks hold major selling points of Young, John Collins, a new head coach in Lloyd Pierce, cap flexibility and future draft picks for star players entering free agency this summer. Earlier today, the Kings and Knicks filled the final open spot on their respective rosters, signing a 15th man to a rest-of-season contract. With the NBA’s 2018/19 regular season set to come to an end next Wednesday, we can expect to see more teams making that kind of transaction in the next week. While teams often leave a roster spot or two open during the season to maintain flexibility or to help reduce their projected tax bill, most of those clubs won’t leave any openings at season’s end. After all, the one-day cap hit for a minimum-salary player signed on the last day of the season maxes out at $8,548. For playoff-bound clubs, that’s a small price to pay to add one more depth piece who might be needed for a game or two in the postseason. For lottery-bound teams, it’s a worthwhile investment to fill that 15th roster spot with a developmental player who could be an option for the 2019/20 roster.